TLDR: Would you rather play with your friends than against them? Do you have a masochistic streak, and wouldn't mind losing TO the game? Does the concept of being a thrill-seeking archaeologist lost in the desert in a race against time for survival appeal to you? Do you have an irrational hatred of dice? Did you once play Forbidden Island, and liked it? If you answered yes to any of these questions, Forbidden Desert is the game for you! 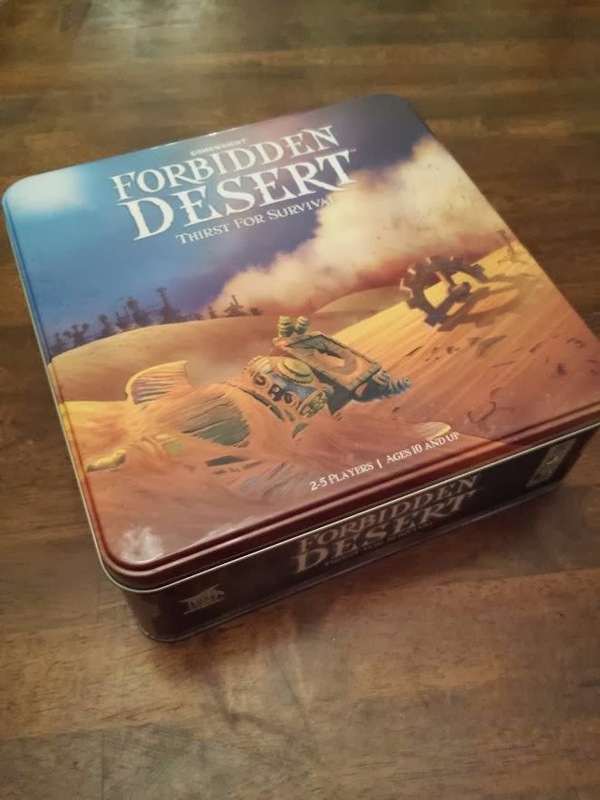 Forbidden Desert is the successor and sequel to the very popular cooperative game Forbidden Island. Both were designed by Matt Leacock, designer of the well-known Pandemic, and like Pandemic, both pit a team of players, each of whom takes on an important role with special abilities, against a force of nature that ramps up in ferocity over the course of the game until the players have either completed their objectives, or they die horribly. In Pandemic, the force of nature was disease, threatening to wipe out the world's population. In Forbidden Island, the force of nature was, well, the island itself, sinking slowly and maliciously into the sea. In Forbidden Desert, the force of nature is a sand storm that never stops, ever, plus a relentless, burning sun that parches your tongues and singes your skin. In Forbidden Desert you lead a team of archaeologists sent to excavate a city buried in, and this should only be a surprise if you haven't been paying attention up to this point, the desert. As your plane neared the landing area, a sand storm of massive proportions appeared, and you all crashed. With a limited supply of water, you quickly figure out that the only way to survive is to escape, and the only way to escape is to piece together a new plane from ancient relics buried around the city. The situation turns dire, late in the game. Playing Forbidden Desert is straightforward enough to be played with young(ish) children-types, but challenging (oh, it is challenging) and strategic enough to appeal to all ages. The "board" (of sorts) consists of 24 squares, randomly shuffled and arranged in a 5x5 square with a hole in the middle. This hole represents the Eye of the Storm, and will move throughout the game (a process which is wrought with tension). The squares are placed face down, and one of the many tasks you and your compatriots will juggle during the game will be exploring these squares (by moving to them and flipping them over) to discover what secrets they contain. Players take turns with each turn consisting of four actions of their choice. Actions including moving (one square per action), excavating (flipping over a tile that has no sand on it), and removing sand. Players also have a special ability related to their Role; the Water Carrier can hand water to other players, the Climber can move over squares that other players can't, and more. Between turns the Storm Deck rears it's nefarious head. The Storm Deck is a deck of cards, randomly shuffled, that is the game's way of fighting back. It includes Storm Movement (a direction and amount) which has the side effect of kicking up more sand onto the titles the Storm moves over, Storm Picks Up, which increases the number of Storm cards drawn between player turns, and Sun Beats Down, which makes everyone who is not protected from the Sun (by a tunnel or item card) lose a water. As was said above, there is one way to win: gather all the pieces of the escape plane and meet up on the Launchpad. However, there are many more ways to lose. If any player runs out of water, the whole team loses (you all die of thirst!). If the Storm Level rises above 6, the whole team loses, or if all of the sand tiles are used and on the board, the whole team loses (effectively you are buried in the desert!). The crux of the game consists of balancing the acts of keeping a good amount of water on your person, exploring and finding the pieces of the plane, and removing sand from the board. It is the board game equivalent of spinning plates. The game comes in a tin (I think? Some sort of metal) box, and the components are all top-notch, especially the pieces of the plane you are seeking. They actually fit together to form a little minature plane that you can then set your meeples on top of and make plane sounds with your mouth and fly them into the wild blue yonder when you've won the game (or was that just me?). The board tiles have beautiful steam-punky artwork on them to represent the excavated ancient city, and the overall theme of the game is very satisfying on a visceral level. 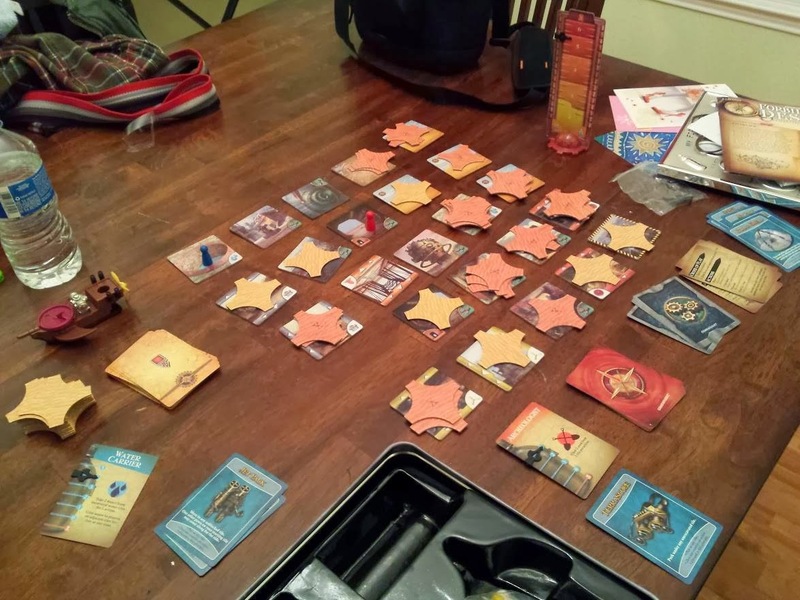 Forbidden Desert is a game that is easy to learn but difficult to master. It rewards cooperation, communication, and strategy. It is fiendishly difficult, and with the randomization of the board tiles and six different roles to play, has definite replayability. As long as you take care to ensure that none of your players are the dreaded Alpha Gamer, bossing everyone else around and generally ruining the experience, you will find that this is a desert you will want to come back to again and again. John H. C. Staton is a software developer and skipped reviewing a game last week. He has no excuse. He still has a website found at FancypantsMonkey.com. It's still not a whole lot to look at.